Apple on Wednesday night released version 2.3 of its Apple TV firmware to add AirTunes streaming as well as support for third-party remotes. The patch, available solely through the Apple TV's built-in update feature, is said in Apple's release notes to let users now stream music from the media hub to speakers connected to an Airport Express or to other Apple TVs in the home, letting it serve as a form of repeater. Owners are also no longer tied to the built-in Apple Remote and can now teach Apple TV to recognize other infrared remotes in place of the official controller; the technique potentially allows universal remotes such as Logitech's Harmony line. Other additions include the option for playlists that include a mixture of various audio and video formats as well as the ability to adjust volume in the music section. Readers are encouraged to list other, unpublished features they may discover in the 2.3 firmware. Already had Harmony Remote working with AppleTV. Streaming to Airport Express is a welcome and long-awaited feature though. Now to download & test. You've misunderstood. This update isn't necessary in order to use a universal remote. The whole point of a universal remote is that it has a database of codes that third party remotes use, and failing that can learn the codes directly from remotes, and can therefore replace any IR remote. The Harmony database includes the Apple remote codes and therefore can already be used to replace an Apple remote. This AppleTV update takes the idea in the opposite direction: the AppleTV's receiver can learn to respond to non Apple remote codes. This is useful because many TV manufacturers ship TVs with remotes that will also control the same brand's DVD players. So let's say you've got a Sony TV, no Sony DVD player and an AppleTV. The Sony TV's remote has play, skip, menu etc. buttons (for controlling a Sony DVD player that you don't actually have). Now, with this update to the AppleTV, the Sony remote can be used to control the AppleTV. In conclusion, this update eliminates the requirement for a universal remote if you've a simple setup of a TV and an AppleTV, and the TV's remote control has the necessary play, skip etc. buttons. Now all they have to do is make it useful by allowing DVR functionality. Why this has not be implemented is beyond me. ATV has far less functionality than competing units. Maybe because ATV is supposed to replace your cable box, not supplement it. Why pay a flat subscription rate to the cable companies when you can have a la carte! I predict a DVR in my aTV just as soon as there's an FM tuner in my iPod. This is pretty cool. I don't have to have the G5 that holds my music turned on for the Airport Express. I think it should stream to Macs and iPhones / touch too. My AppleTV is rebooting right now with 2.3. I am totally psyched about the AirTunes. I've been wondering why this wasn't there before!! Now my home music system is complete. Hah, I swore the Apple TV had the AirTunes capabilities since launch! Well, the new IR stuff sounds good. Please stop while you're behind. The iTunes Store, which provides content (a la carte) to Apple TV users, is in direct competition with cable TV boxes/subscriptions. Now a Netflix Instant Watch portal similar to the flickr photo album portal? That's a possibility (though I suspect Apple would want to enhance such a service by making the movies actually download to the hard drive and make all Instant Watch movies browse-able right off the device, rather than requiring interaction with a computer). Yep, the Netflix and Flickr tie-ins would be nice. A Safari browser and optional keyboard for the AppleTV we be nice too. These DVR Vs. no DVR debates are always so US-centric. Ever heard of the rest of the world? Just because you guys don't get anything decent transmitted free-to-air, doesn't mean that's the case in the rest of the world. If I could get an AppleTV/Mac Mini with blu-ray and FreeView (UK digital terrestrial broadcasts) DVR, I would. I would like keyboard support so I can use a Logitech wireless keyboard for text entry, instead of having to use the Apple Remote to peck at letters on the screen. @people who might want to turn this into a why does anyone want Blu-ray discussion? Based on your comment, I am not so sure you know what a DVR does. It has nothing to do with the signal or content. I understand people's criticism of the Apple TV, including the lack of a DVR function. It doesn't really affect me as we don't watch cable / satellite / OTA broadcasts. I download stuff and add it to the library. Missing for me from the ATV is access to streaming content sites. It's possible with Boxee on the ATV but should be part of the standard software. I know why it isn't, though. Apple's revenue model for the ATV / iTunes would be severely undermined. Speaking of Boxee, does the update break it? I'm fully expecting to have to reinstall it, but I hope it still works. What a bizarre statement. We're talking "Digital Video Recorder" right? Like a VCR but with an HDD instead of tapes. Some people say that Apple shouldn't add DVR functionality because AppleTV competes against cable. That statement is making an intrinsic implication that the only stuff worth recording is transmitted over cable which requires a subscription. I'm saying that actually, there's plenty of stuff worth watching that's transmitted for free. For me, the AppleTV's ability to rent HD movies is interesting. Its ability to stream content from a computer in the house is interesting. But if I had an AppleTV as it stands now, I'd still want a DVR and a blu-ray player. Why have three devices when a Mac Mini with a blu-ray drive, a couple of FreeView tuners and some decent Apple software could do it all in one, better, and for less money overall? I think it must just increase overall compatibility with normal remotes. Where have you been?? 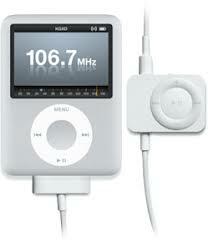 Most iPods except the touch have FM capability ?!?! You just need the Radio Remote.